The ultimate double-blade knife for big game with our patented replacement razor-blade knife on one side, plus gutting blade on the other to open game like a zipper. This is the sharpest, strongest, replacement razor-knife available with blades that change safely and easily at the push of a button. The black-oxide coated blade holder supports the razor-blade for the strength of a standard knife and sharpness of a surgeon’s scalpel. Our signature gutting blade cuts underneath the skin without cutting hair, or piercing internal organs that can spoil fresh game meat. 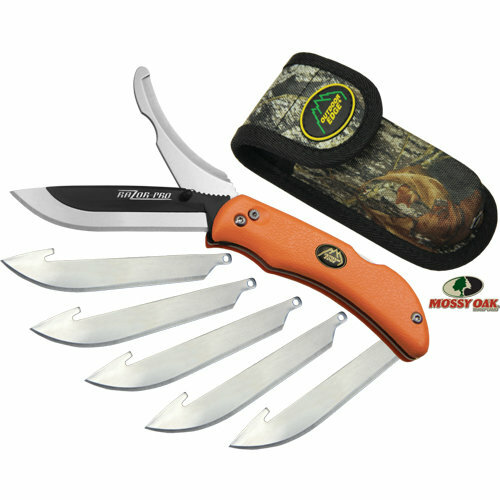 Both blades open and close independently with one hand and lock securely. The Razor-Pro comes complete with six 3.5” Japanese 420J2 stainless replacement blades and a nylon sheath with pockets to hold both the knife and spare blades. Replacement packs of 6 are sold separately. Rubberized TPR handles are available in black with a black nylon sheath and blaze-orange with Mossy Oak® camo sheath. The blaze-orange handle is easy to spot on the ground, saving valuable time in the field while preventing loss.